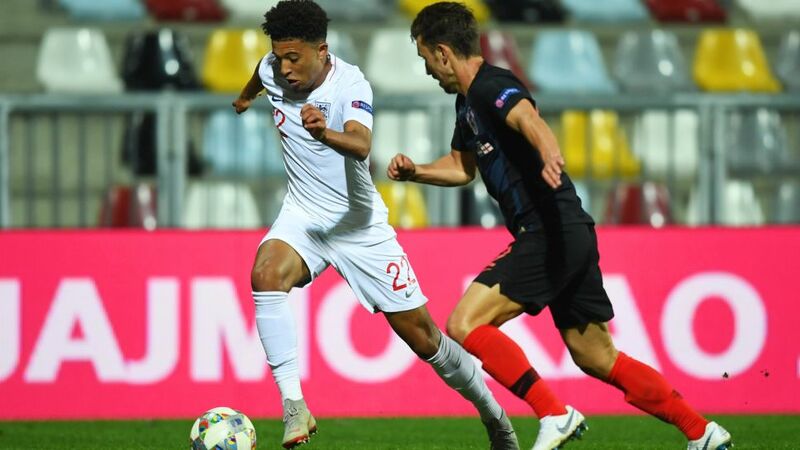 Borussia Dortmund teenager Jadon Sancho's rapid rise in the game continued on Friday evening with a senior international debut for England against Croatia in the UEFA Nations League. The 18-year-old, who was called up by manager Gareth Southgate for the first time in the wake of his eye-catching form in the Bundesliga and UEFA Champions League, entered the pitch in the 77th minute for former Manchester City team-mate Raheem Sterling in the behind-closed-doors encounter in Rijeka. In the 13 minutes he had on the pitch, Sancho impressed with imposing sprints and dribbling directly at the Croatia defence. He was almost rewarded with an assist in the final minute but his cross was behind Tottenham Hotspur striker Harry Kane. The match finished 0-0, leaving the Three Lions on one point from their first two outings in League A Group 4. Sancho's next chance to appear for England is away to group leaders Spain in Seville on Monday evening.